RIT’s Big Shot No. 30 is scheduled for around 9 p.m. Sept. 6, when the photo team will point its lenses at RIT’s Golisano Institute for Sustainability, Louise M. Slaughter Hall and the surrounding quad. The next RIT Big Shot will be very close to home. While details are still being finalized, organizers have announced on Facebook that the 30th Big Shot is scheduled for around 9 p.m. Saturday, Sept. 6. 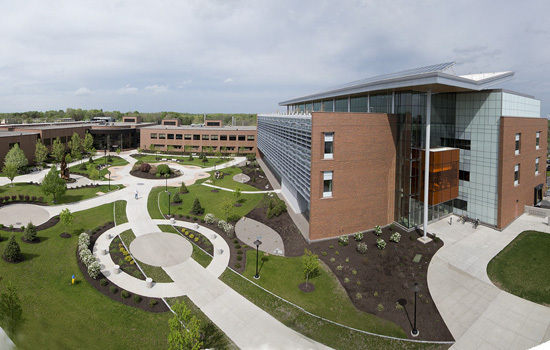 This time, the photography team will point its lenses at RIT’s LEED Platinum-certified Golisano Institute for Sustainability, along with Louise M. Slaughter Hall and the surrounding quad. Computational photography refers to computational image capture, processing and enhancement techniques that extend the capabilities of digital photography. Examples include panoramas and high-dynamic-range imaging, which is the use of differently exposed pictures of the same scene to extend dynamic range beyond even that of analog film-based media. Nikon is once again supporting the project by loaning high-end photographic equipment. The Big Shot photograph will be produced using two Nikon D800 bodies. This marks the fourth time that the Big Shot will take place twice in a calendar year. The team captured an icy High Falls in early February. It also marks the sixth time that the nighttime photo has taken place on RIT’s campus. The Big Shot is often described as “painting with light” because volunteers are asked to “paint” or shine their light source onto a particular area of the landmark while the photograph is taken. The light sources are usually either handheld flashlights or camera flash units. Since RIT started its Big Shot project in 1987, the event has traveled to several national landmarks and twice crossed the Atlantic Ocean. Through their viewfinders, Big Shot photographers have captured such landmarks as The Alamo in San Antonio, Texas; the U.S.S. Intrepid in New York City; Pile Gate in Dubrovnik, Croatia; the Royal Palace in Stockholm, Sweden; and the Smithsonian National Museum of the American Indian in Washington, D.C. This year, the Big Shot team will be working closely with RIT’s New Student Orientation Office to make the event part of the official welcome for the university’s incoming freshmen. RIT Facilities Management, Alumni Relations and Public Safety also will have a significant role, according to Peres. For information and updates, go to http://bigshot.cias.rit.edu/.